The first room is The Studio. This open space is 10m by 4m and can fit 10 people on yoga mats in. It can be great for those who want to run smaller to medium sized classes that focus on quality, not quantity. The Studio is also ideal for group classes, presentations and lectures to small groups. At the moment the space is being used for antenatal classes, baby massage and baby yoga. The other side of the business is more focused on talking therapies. There are three rooms available. The Bandler Room comes equipped with two large, comfortable chairs and is ideal for hypnotherapy sessions. The Dale Room is smaller than the Bandler Room but is still perfectly formed for talking therapies like CBT or counselling. 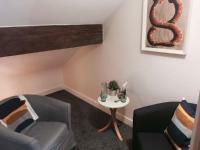 The Abbey Room is our massage therapy room and comes equipped with a consulting area and quality massage bench. Health professionals can book the room online and the rooms can be used 24 hours a day, 7 days a week. The wellness centre is accessed via a cobbled gennel and a flight of stairs so it may be difficult for some people with mobility issues to access.